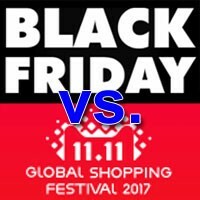 China’s Singles Day vs America’s Black Friday. Singles Day sales 11.11 – China’s biggest online shopping holiday – have made their way to the U.S. and are gaining momentum. Every November, the average shopper in the US and China spends a lot of money on the Internet. It happens first in China on Singles Day, which falls on November 11. Next it’s the turn of American shoppers the day after Thanksgiving on Black Friday. Single’s day became the Chinese equivalent of the American Black Friday or Cyber Monday, only that the Single’s day is bigger. It has become a big festival of online shopping. Next to Singles’ Day in China, Black Friday look like pathetic shadow of shopping days. In 2016, retailers on Alibaba’s eCommerce platform took in $17.8 billion in gross sales on Singles’ Day, compared with the $3.34 billion that consumers spent online during Black Friday that same month. Why hasn’t “Singles Day” spread beyond China to Western countries? China is not adversar. Rival maybe but not adversary. In China it’s not an official nor recognized holiday.